At last night’s Grammy Awards, we all witnessed a selfish and childish display after Frank Ocean won the award for Best Urban Contemporary Album. As Ocean walked to the stage and the crowd gave him a standing ovation, one of his fellow nominees defiantly remained seated, showing a lack of maturity and respect for his fellow performer. Yep, that sure was disgraceful behavior on the part of Miguel. What, you thought I was going to say Chris Brown? All day long, self-righteous journalists have been calling out Brown for not joining in the standing ovation in honor of Ocean. That shows what a jerk he is!, people have written. But Miguel didn’t stand either. It seems the selective outrage machine failed to notice that. And who cares if Brown remained seated? Standing ovations are not mandatory. Participation is voluntary. There are way too many standing Os at award shows already. Plus, Brown (and Miguel) just lost his category. I don’t think too many performers are eager to give ovations to the person who just beat them. In fact, imagine if Brown had stood and applauded with everyone else. He’d be getting criticized for being phony. We’d be taking him to task for pretending like he was happy for Ocean when he know he really hates his guts. This was a no-win situation for Chris Brown. The media were going to tear him to shreds no matter what. So he did what, to me, seems like the exact correct behavior. He remained seated but clapped nonstop until Ocean reached the microphone. Miguel did the same. That’s entirely reasonable behavior. The folks who are blasting Chris Brown today obviously hate Brown already and are using this non-incident to fuel their anger rather than examining the situation objectively. Normally, I’m the last person in the world who would defend Chris Brown, because there are no excuses for much of his behavior over the past few years. But when we start blasting him for absolutely nothing, then his claims that all the haters are just out to get him begin to have merit. 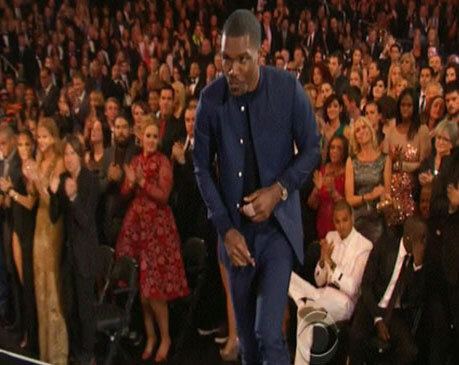 Update: I just checked the video, and Chris Brown did in fact stand up when Ocean won his second Grammy of the night, for Best Rap/Sung Collaboration, along with Jay-Z, Kanye West and The-Dream. So now there’s even less reason for people to be upset about this. 2013 Grammy Awards: Complete List of Winners!